First, author Neil Geiman shows you how to train a bat in this short clip. Second, Neil explains why you shouldn’t be afraid of buttons in this promotional trailer for “Coraline”, the animated movie made from his book. I promise you, if you weren’t afraid of buttons before this video, you will be afterwards. Re: Robins in the ‘Hood! 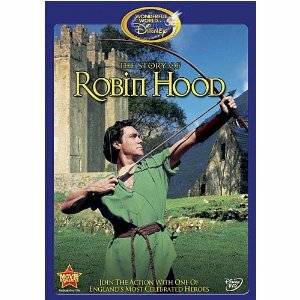 Many versions of the Robin Hood tale have been retold on both the movie and television screens. Like most people, I had heard of these film incarnations, but hadn’t seen any of them so I decided to take advantage of the renewed interest in the Outlaw of Sherwood to view a few myself. 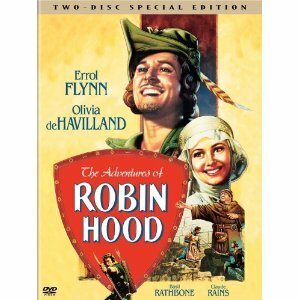 Let’s start with the movie everyone always cites: The Adventures of Robin Hood with Errol Flynn filmed in 1938. In this story, Robin is a Saxon guerrilla fighter out to save the English country and the people from the oppression of Prince John played with delicious wickedness by Claude Raines. Basil Rathbone as Guy of Gisbourne is Robin’s main antagonist with the Sheriff of Nottingham character being more of a comic buffoon. Rathbone sets the gold standard for icy-cool villains and his sword fight with Flynn has become iconic. The main theme of this film is that a leader’s first duty is to take care of his people, not to go adventuring overseas, leaving that responsibility to an outlaw as Robin tells a disguised King Richard. Grittiest moment in the film: the fight between Much and the assassin sent to kill the returned King Richard. If you’re buying this film for your collection, be sure to get the DVD with the bonus material, part of which is “Robin Hood Daffy” (as seen above). 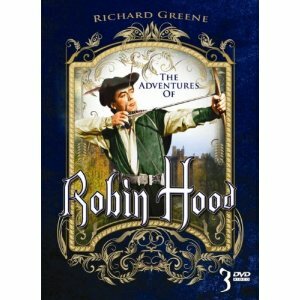 The Adventures of Robin Hood (TV series, Richard Greene, 1950s): A half-hour series for children with stories adults can appreciate it. Scripted by writers who had been blacklisted in McCarthy-era Hollywood, the plots often revolve around the characters choosing between what the authorities say to do and what is morally right. The acting and writing are both solid and the series is surprisingly high quality. 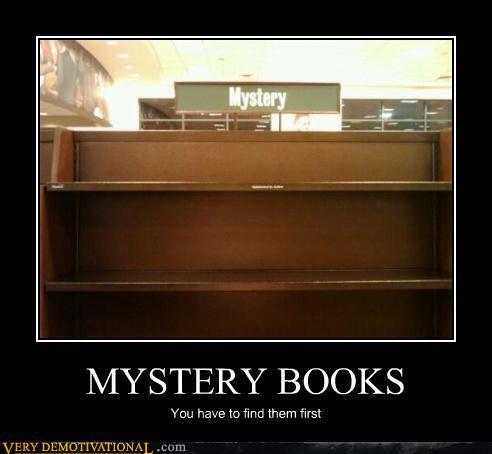 It also has the advantage of being very cheap on DVD. The Story of Robin Hood (1952, Richard Wood): A Disney film with a good deal of music, a believable plot line, and a feisty Maid Marian. The best thing about this film is the strong storyline. Robin’s frame up and subsequent conviction for killing a forester is played convincingly. It’s easy to see why people would believe him to be guilty. The main villains are the conniving Prince John who plots to take his brother’s throne and DuPlessy, the oppressive Sheriff of Nottingham. Queen Eleanor has a major role in this story as she is raising the ransom to save her son, King Richard. For a movie over 40 years old, this film holds up very well and I would recommend buying it. Robin and Marian (1976, Sean Connery and Audrey Hepburn): The most non-traditional Robin Hood film to date and the one that gets mentioned the least because it deals with the final chapter of Robin’s life–the Death of Robin Hood. 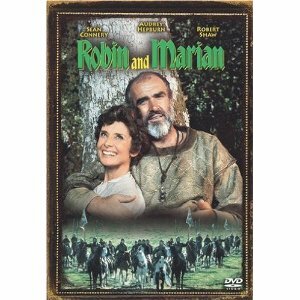 In this movie, Robin Hood (Sean Connery) joined King Richard’s army and went on the Crusades. Disillusioned with Richard and with soldiering, Robin and Little John return home after twenty years away, intending to live quietly in Sherwood. But when the news gets around that the famous outlaw has returned, people begin flocking to him again and the authorities, fearing a rebellion, move against him. James Goldman, who wrote “Lion in Winter”, penned the screenplay for this film and the result is a story that is by turns both poignant and funny. No one is entirely bad or entirely good. Connery’s Robin isn’t a bad guy per se, but trouble follows him around and you can see why the authorities want to get rid of him. Robert Forshaw plays the only sympathetic Sheriff of Nottingham you will ever see on screen. He and Robin have come to respect each other over the years and really don’t want to fight, but are forced by circumstances into the final battle. The late Richard Harris plays King Richard, Ian Holm has a brief cameo as King John and Kenneth Haigh is Sir Ranulph, the ambitious knight. The luminous Audrey Hepburn plays Marian, the woman Robin abandoned to go off to the Crusades, and who has since become a nun. A definite must-have for any collection, this film provides a human (and humane) counterpoint to the other “legend” stories. 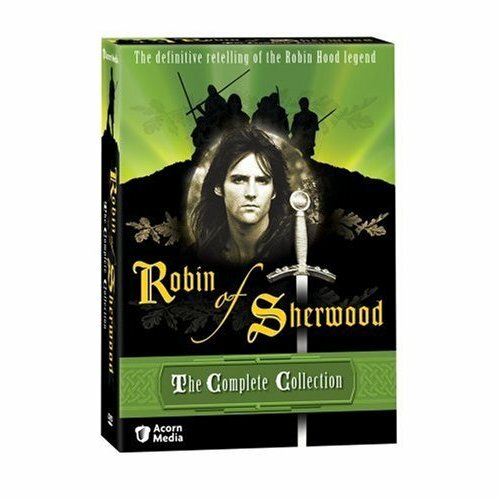 Robin of Sherwood (Michael Praed, Jason Connery, 1984-86) This series was ground-breaking in many ways and still holds up well over the passage of twenty-some years. Unlike many other stories which portray Robin as the leader of a small village of outlaws, in this series, Robin leads a small band of guerilla fighters, never more than 7-8 in number. Praed’s Robin is a Saxon freedom fighter defending Saxon peasants against the depredations of the corrupt Norman overlords, particularly the Sheriff of Nottingham (played with delicious glee by Nicholas Grace), the sheriff’s brother, Abbott Hugh, and the abbott’s right hand thug, Guy of Gisborne. Magic plays a strong role in this series with Robin and his band frequently going up against sorcerers and witches. Robin himself is Herne’s Son, called by Herne, God of the Hunt/Forest, to defend the weak and the helpless. When one Robin dies, another is called. Thus the “Hooded Man” can never die. This series was the first to introduce a Saracen character, Nasir played by Mark Ryan. The idea of a Saracen as part of the band has since been picked up by “Prince of Thieves” and by the BBC “Robin Hood” series. You can now get all three seasons for an excellent price on Amazon. 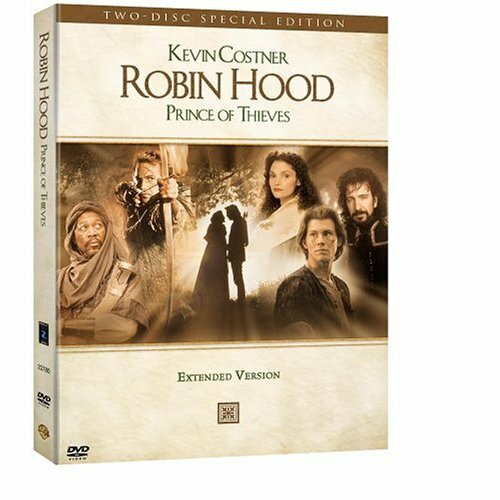 Robin Hood: Prince of Thieves (Kevin Costner, 1991): Like many people, I watched “Prince of Thieves” when it first came out and enjoyed it at the time. However, the film really does not stand up well to the passage of years. If you decide to buy it, get the extended version as it has extra footage of Alan Rickman and Geraldine Ewan whose roles respectively as the psychotic Sheriff of Nottingham and his mother, the witch, are the best thing about the film. The main problem with the film is not Costner’s accent or the fact that all the characters seem to be wearing neckerchiefs which they never use, it is the script’s lack of focus. We don’t find out the point of the story–the importance of family–until the very last reel which makes that audience feel that they have gone on a very long journey for very little return. The Mel Brooks film, “Robin Hood: Men in Tights” is a direct parody of this film. 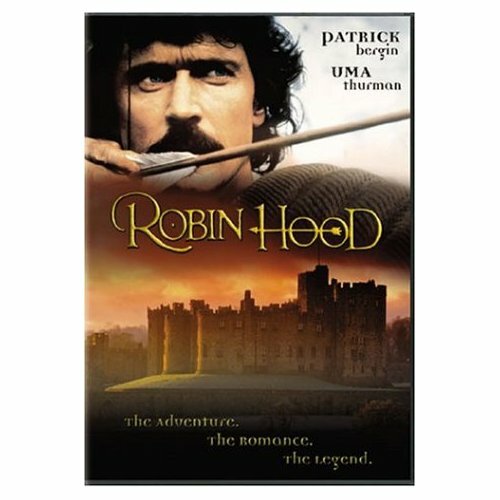 Robin Hood (Patrick Bergin, Uma Thurman, 1991): One of my favorite screen portrayals of Robin Hood to date. Unfairly overshadowed by the big screen “Prince of Thieves”, this television movie is truly wonderful and well worth the purchase. The screenplay by Sam Resnick is a thing of beauty. While many Robin Hood adaptations often have a choppy feel to them, each episode of the Robin Hood legend recounted here serves to ratchet up the tension and advance the story. Uma Thurman is a plucky, determined Maid Marian and Jeroem Krabbe plays her nouveau riche uncle, the Baron Deguerre. Again, Normans vs. Saxons is the main conflict here. The main theme is pride and how the inability to see the other fellow’s point of view or to admit that we are wrong often leads us into self-destructive actions. Robin Hood (Jonas Armstrong, 2006-2009): A BBC series developed by Dominic Minghella and Foz Allan and deliberately designed to appeal to younger (teen) viewers. The cast is relatively young (in their 20s) and the costumes, especially Marian’s, often appear oddly modern, a deliberate choice on the part of the producers. 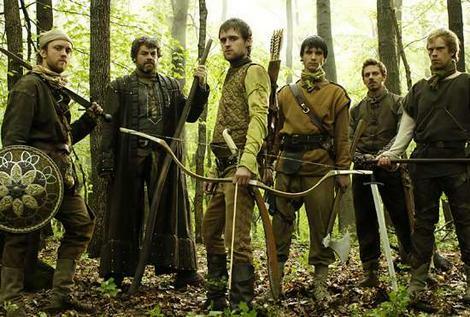 Robin, Earl of Huntington (Jonas Armstrong) and his servant, Much (Sam Troughton), return home to Locksley after the Crusades to find the sociopathic Sheriff of Nottingham (Kevin Allan) and his chief henchman, Guy of Gisborne (Richard Armitage), oppressing the population. Outlawed after refusing to hang his own serfs, Robin and Much join forces with an existing gang of outlaws lead by Little John (Gordon Kennedy). The most intriguing character is Guy of Gisborne who fluctuates between blind ambition and his unrequited love for Marian. Fans generally agree that the second season is the strongest (and darkest) while the third season is weaker. Robin Hood (Russell Crowe and Cate Blanchett, 2010): The latest entry in the Robin Hood pantheon, this movie directed by Ridley Scott is actually much closer to the 1976 film, “Robin and Marian”, than any of its predecessors. This production also focuses on one chapter in Robin’s life, in this case How Robin Became an Outlaw. 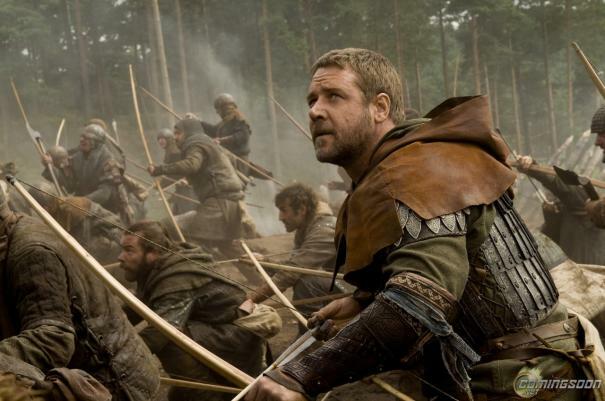 Robin (Russell Crowe) is an archer in King Richard’s army. After angering the king, Robin and his fellow archers wind up in the stocks, but are saved from an unpleasant fate by the king’s death in battle. Making their way back to England, a chance encounter with a dying knight gives Robin and his men the idea of posing as knights–a decision that winds up involving them in escalating political intrigue. Cate Blanchett brings dignity and strength of will to her character of Marion Loxley and Max von Sydow is fantastic as her aging father-in-law, Sir Walter Loxley. A strong supporting cast, particularly Oscar Isaac as King John, give stand out performances. I think it’s safe to say that this is the first Robin Hood film that has ever featured the Magna Carta. This movie was released in May and will be coming out on DVD later this month. I would recommend picking up the two disc set for the deleted scenes. Just a couple of photos I’ve been saving …. 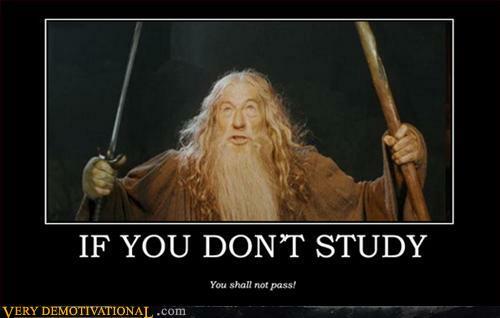 Words of wisdom from Gandalf. Bob Hallett from the folk/rock band “Great Big Sea” gives some excellent advice on his blog for doing interviews with journalists of all kinds. Although his advice is geared for aspiring musicians, I think it is equally useful for any amateurs who find themselves thrust into a public relations position–for example, doing publicity for their local theater production. With the fall performance season starting up, I thought folks would appreciate the link. I’m on the upswing from the nasty cold that everyone–and I do mean everyone–in the library seems to be infected with. The fall virus is making its rounds and at least three departments have fallen victim, ours included. Sadly, we’ve been so short-staffed that people have had to come to work anyway which is necessary for the workflow, but isn’t doing anyone’s recovery any good. I had a major presentation on Wednesday and was able to get through it without losing my voice, but I was wiped after I got home. The real Catch-22 is that I can’t get my flu shot until I’m virus-free. Why do I feel this is going to be an uphill struggle?